Welcome to class! This is the first lesson in our new Chocolate 101 series where we will teach you all about chocolate! Lessons will be short, but informative and fun! Let’s get started with 5 facts about how chocolate grows! 1. Cacao Tree – Chocolate grows on the cacao tree formally known as Theobroma Cacao. Theobroma is the Latin word for chocolate that means “food of the gods”. 2. Cocoa Pod – The leathery oval pod is the fruit of the tree that contains cocoa beans. It ranges from 8-14 inches long and varies in colors of green, yellow, orange, red, purple or maroon, depending on the level of ripeness. 3. Cocoa Bean – The 50-60 seeds nestled in each pods sweet juicy pulp. The seed of the pod is called a cocoa bean once it is removed. 4. Location – Cocoa trees grow primarily in the remote areas of West Africa, Southeast Asia, Central America and South America. 5. 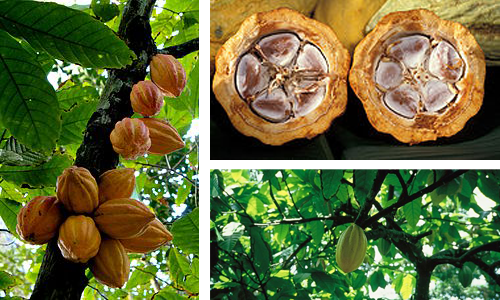 Fun Facts – Cacao trees can produce good cocoa pods for 25 years. Seeds are so bitter that only humans will eat them.